Above: similar symbolic motifs running through the De la Rue and Waddingtons aces of spades. 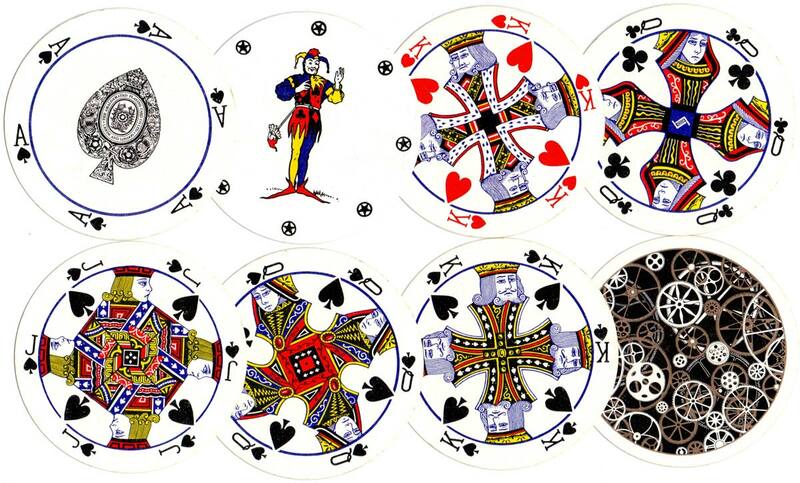 The same style of ace was also used for the Amalgamated Playing Card Co until 1971, when Waddington’s purchased De La Rue's share of APCC; and also in Wheel aces for Pepys. Above: Save the Children Fund, single-colour back design and poor print quality, early 1970s. Above: Doncella Coronets Cigars, early 1970s. Above: Brooke Bond Oxo, 1973. We can date it so accurately by the design on the back, the Surtees racing team utilised the TS14A car in 1973 only. Above: Waddingtons ‘Zodiac Club Playing Cards’ for Pepys, after Alf Cooke was taken over by the Amalgamated Playing Card Company Ltd in 1971. Image courtesy Ken Lodge. Above: a simplified version of the ace of spades with the same lettering was used in Easy to See, large-index packs. c.1974-80. Image courtesy Matt Probert. The Welsh leek was added to the decoration of the ace of spades in 1974. While the preferred Welsh national symbol is often a daffodil, a dragon or a harp, the leek is an ancient traditional emblem for Wales. The British £1 coin representing the Welsh part of the United Kingdom has a leek on the reverse. Thus the ace of spades design combines heraldic elements that reflect the legal jurisdictions of the United Kingdom: the Tudor rose for England, the leek for Wales, the thistle for Scotland and the shamrock for Ireland, all topped by a Royal Crown. Above: the registered trademark symbol ® appears on the joker late 1982 start of 1983. Above: various advertising backs from this period. Above: advertising deck for TGWU by Waddingtons. Above: advertising deck for Magic Circle by Waddingtons. Above: advertising deck for Precise Coltène by Waddingtons. The cards are smooth finish, but good quality and nicely printed. 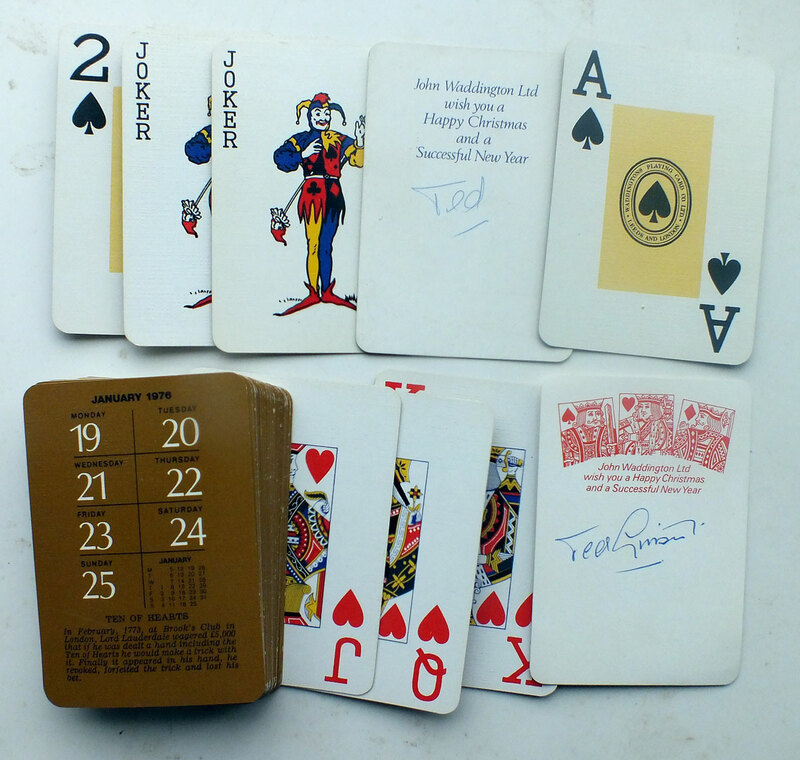 Above: patience sized pack published for Penguin books in c.1975 with the Goodall cross-legged joker and older-style Waddington's courts. All above images courtesy Matt Probert. From the early 1990s packs appear with the words “Leeds and London” omitted from the ace of spades. Above: British Airways pack with simplified lettering on the ace of spades, 1990s. Hasbro, a large toy company, bought Waddington's Games in 1994. Waddington’s No.1 Playing Cards are still a best seller in Britain, but today they are manufactured in Poland and marketed by Winning Moves, who bought the brand from Hasbro. Above: "Union Flag" deck from the London 2012 Olympics (produced in 2008 by Winning Moves). The legend inside the ace has been simplified.